Images and a video clip of the shivering dog being rescued were posted on Facebook by a team member yesterday (Apr 12). The dog, found about 220km from the shore, was believed to have fallen from a fishing trawler. 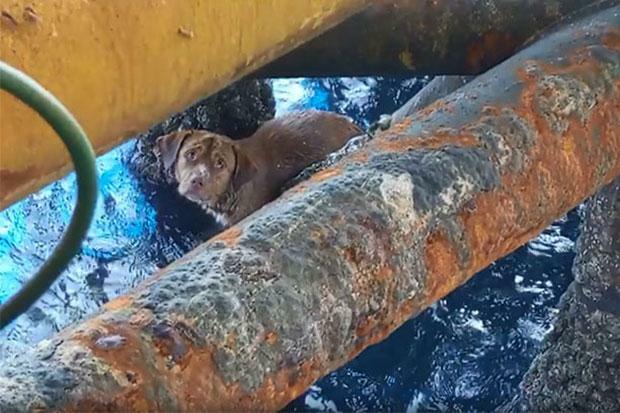 Vitisak Payalaw, of Chevron Thailand Exploration and Production’s oil drilling team, wrote on Facebook: “On April 12, we found a dog trying to swim to a pole of our oil platform, about 220km from the shore. As wind waves were rather calm that afternoon, we could clearly see its head and water rippling as he was swimming toward our oil platform. If the waves had been strong, we wouldn't have seen him. The dog's condition has significantly improved after being treated and fed with mineral supplements. Many netizens thanked and praised the rescue team after the story was shared online. Mr Vitisak later posted on Saturday he would not accept donations.